Find homes for sale in the community of Castle Pines North near Denver, Colorado. The Castle Pines North real estate listings below are the most recent homes in the Castle Pines North community to hit the market. Our Castle Pines North list of homes includes the newest homes listed on the Castle Pines North MLS database for homes for sale in the Castle Pines North community near Denver, Co. Incorporated in February, 2008, Castle Pines is a city of about 10,000 located approximately 20 miles south of Denver in Douglas County, Colorado. The city's vision is to "Enhance our community's unique character by ensuring excellent infrastructure, safe neighborhoods, maximum citizen participation and conscientious development that balances open space, residential and commercial uses." 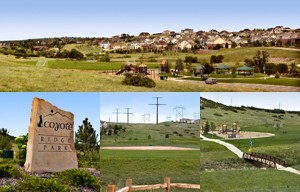 The City of Castle Pines covers approximately 6,114 acres or 9.55 square miles. The 2008 incorporation of Castle Pines included 2,437 acres which extended west and north to Daniels Park and Highlands Ranch open space, south to the unincorporated area of Castle Pines Village and originally east to Interstate 25. At the time of incorporation, Castle Pines was Douglas County's first new city since 1995, Colorado's first new city since 2004, and Colorado's 271st municipality. Castle Pines North has quickly become of the most desirable places to live in the Denver metro area with many luxury homes and amazing views of the front range. See below for the latest homes for sale or call us today to begin your search!